Socrates ungraved (33’, 1918/2016 IW), concerto for violin & string orchestra based on ‘Socrate’ by Erik Satie. Premiere: 11.01.18; Dušica Mladenović, Belgrade Philharmonic, Belgrade/SRB. Variations on the name of Fleischmann (10’, 2016 IW) for orchestra. Premiere: 16.11.16; Cork Fleischmann Symphony Orchestra, cond. Keith Pascoe, City Hall, Cork/IRE. Written with funds from an Arts Council of Ireland Artist-in-the-Community scheme, administered by CREATE Ireland. Arnkell-lág (12’, 2014 IW) for brass band. Premiere 11.10.14; Arklow Silver Band; Mermaid Arts Centre, Bray, Co. Wicklow/IRE. Written with funds from Wicklow County Council. Causeway (18', 2013 RIC) for orchestra. Premiere 26.03.14; Ulster Orchestra cond. JoAnn Falletta; Ulster Hall, Belfast/UK. Commissioned by the Ulster Orchestra with funds from the Lottery Unity of the Arts Council of Northern Ireland. Flags and Emblems (18', 2012 IW) fantasy for piano, orchestra and flute band. 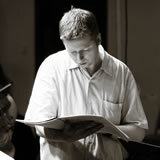 Premiere 30.10.12; Matthew Schellhorn, Ulster Orchestra, Ballygowan Flute Band/I. Wilson; Ulster Hall, Belfast/UK. The stars, the seas (25', 2011 RIC). 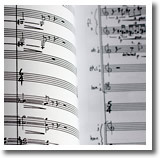 An tIarthar (10', 2010 IW) for string orchestra. Premiere 09.10.10; Concerto Málaga & Donegal Chamber Orchestra/Massimo Paris; An Grianán Theatre, Letterkenny/IR. Miranda, Ariel, Umbriel (12’, 2006 RIC) for symphonic wind ensemble. Sullen earth (14’, 2005 RIC). Concerto no. 3 for violin and string orchestra. Seascape with high cliffs (13’, 2006 RIC) for brass band. Premiere 17.10.04; Orchestra dell’Arena di Verona/J. Debus; Venice Biennale/I. Commissioned by the Venice Biennale. Mutazione (18’, 2003 UE). Concerto for piano and orchestra. Premiere: 18.01.16; Matthew Schellhorn, Ulster Orchestra/D. Brophy; Ulster Hall, Belfast/UK. Premiere 20.02.04; RTÉ Concert Orchestra/J. Mercier; RTÉ Living Music Festival, Dublin/IR. Inquieto(18', 2001 UE). Concerto for marimba and orchestra. Premiere 21.04.02; Pedro Carneiro, mba, London Mozart Players/Andrew Parrott; Queen Elizabeth Hall, London/UK. BBC Proms, Royal Albert Hall, London/UK. Commissioned by the BBC Proms. An angel serves a small breakfast (17’, 1999 UE). Concerto no. 2 for violin and orchestra. Premiere 11.07.00; Rebecca Hirsch, vn, BBC National Orchestra of Wales/P. Daniel; Cheltenham Festival/UK. Premiere 24.04.99; Camerata Ireland/B. Douglas; Stormont Castle, Belfast/UK. Messenger(37’, 1998-9 RIC). Concerto no.1 for violin and orchestra. Limena (18’, 1998 UE). Concerto for piano and string orchestra. Commissioned by the Irish Chamber Orchestra. Who’s afraid of Red, Yellow and Blue? (20’, 1998 UE). Concerto for alto sax and orchestra. Commissioned by the Ulster Youth Orchestra with funds from the Arts Council of Northern Ireland Lottery Unit. Rich Harbour (31’, 1994-5 UE). Concerto for organ and orchestra. N. Willen; National Concert Hall, Dublin/IR. Jointly commissioned by RTÉ, National Concert Hall Dublin and Arts Council of Ireland. Premiere 22.04.94; Ulster Orchestra/M. Bamert; University of Ulster, Coleraine/UK. Commissioned by the University of Ulster. Premiere 25.10.91; Norwegian Radio Orchestra/C. Eggen; Ultima Festival, Oslo/NO. Winner of the Ultima Festival composition prize, 1991.